Our mission to create a game in a week has begun! If you want to read more about what we’re doing, and why, then check out our last blog post. 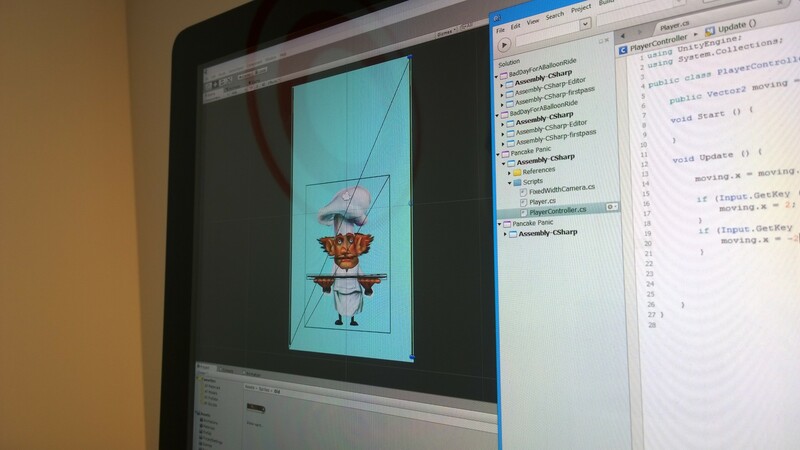 The game we are developing is called Pancake Panic. It’s an “endless game” in that there is one “level”, and you play until you run out of time. The aim of the game is to catch as many falling pancakes as you can before the time runs out, stacking them up carefully as there are physics in play. There will be the ability to bank your stack at certain points in the game, and the ability to acquire more time. The first day on a project is always a bit crazy. There’s a lot of setting up to do, and seeing as there’s been absolutely zero preparation for the project (we’re trying to do everything within the confines of a week), the first day is a bit of a bitty one. I’ve been setting up the project, and sorting out the fundamentals of the game. The game itself doesn’t have levels, as such. It’s one endless game which you play until you run out of time, so these fundamentals include setting up the gameplay area, setting up the camera (which is fixed), adding walls to limit the player’s movement, and setting up the controls for the game (it would be a nightmare to test otherwise!). 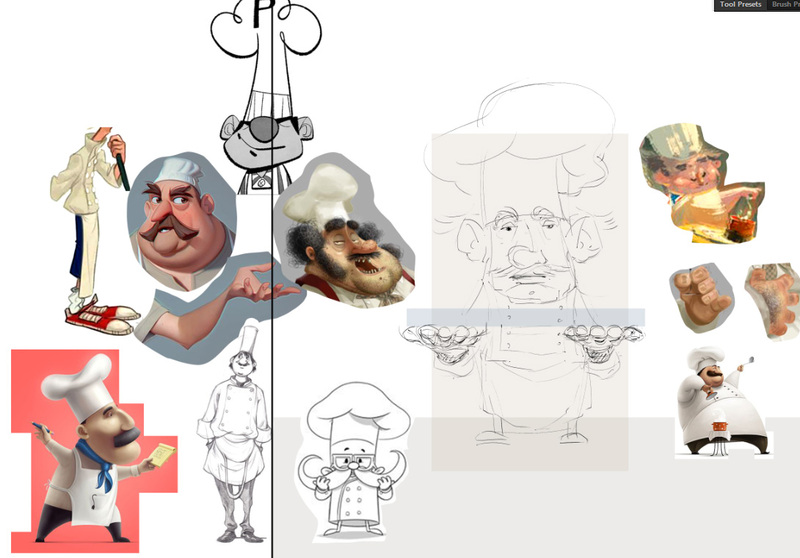 At the minute there are no graphics other than placeholders – a solid block for the background, and a static graphic for the chef. But the controls are working (keyboard and controller at the moment, I’ll add touch controls tomorrow). We’re developing this game in Unity, and I’m coding in C#. The goal here is to make as much of the code cross-platform as possible, with the platform specific stuff sitting on top of the game logic. You can see some of Alex’s research, and inspiration, and see how it evolved into the final character. Alex has carried forward the style he developed on Bad Day for a Balloon Ride, which gives him a wonderful hand-drawn look and feel. So, we’re off to a good start. Tomorrow, I’ll begin programming the gameplay with regards to the pancakes and the bonuses, setting up our scoring system, and adding touch controls. 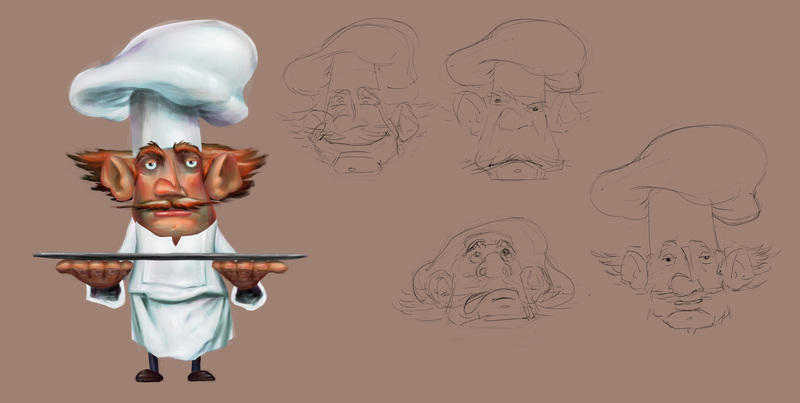 Alex is working on expressions for the chef (he needs a name, right? ), before he moves onto the pancakes and the background elements. Check back tomorrow to see how we’re getting on!